I’m joining in with a new linky project from the lovely Dear Beautiful this year, looking at siblings. 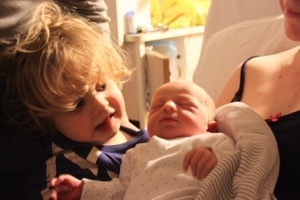 As you know my two only became siblings less than a month ago when Alexander was born on the 16th December, so we’re still very early in their relationship and to be honest both are largely still indifferent to each other! However this month, Elliot has enjoyed telling people about his brother and recently when picking him up from nursery we’ve been told that Alexander has been a big topic of conversation for Elliot. He’s starting to be quite caring for his baby brother and it’s really sweet when he kisses him goodnight. There’s been a few occasions then I’ve been asked to “put Alex down” and we’re still in a phase of needing mummy to do things like feeding Elliot his weetabix, which although annoying is totally understandable I think and hopefully something he’ll grow out of. I’m really looking forward to watching these brothers get to know each other over the next year so this linky project couldn’t come at a better time for us! This entry was posted in Alexander, Elliot, Family, Month, Photo, Uncategorized and tagged photo project, Siblings. Bookmark the permalink. Love the expression in that shot – so lovely! Thanks Annie! I think there was quite an element of surprise that the baby everyone had kept talking about was actually here!